We are obsessed with rainbows and rainbow DIY projects right now. We’ve made a list of rainbow recipes, thrown a rainbow birthday party, made rainbow cake, and included a lot of rainbow fun in our St. Patrick’s Day round-up. 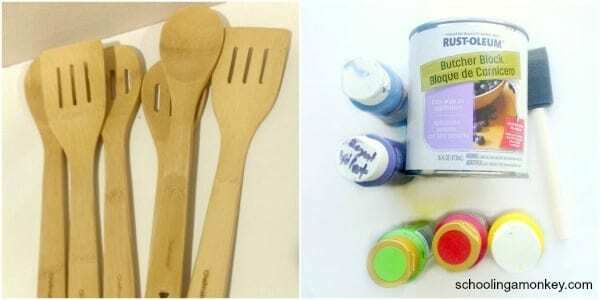 Today, we’re continuing the rainbow DIY projects fun with these rainbow kitchen utensils. If you want to make your own, here’s how to do it! 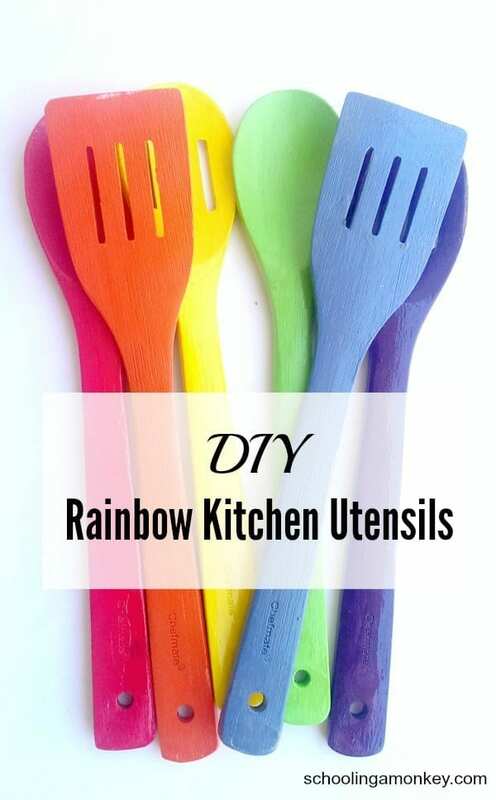 These rainbow painted kitchen utensils are a fun way to brighten up your kitchen. Sand the utensils until they are smooth. Our utensils came with a bit of finish already on them, so we just sanded that off. Wipe them clean with a damp cloth and make sure they are completely dry before moving on. Paint the utensils in their rainbow colors. We found that painting one side at a time cut down on mess. Paint one side, then flip them and paint the other side. Our utensils required about 3-4 coats of paint. Surprisingly enough, it was the purple that required the most coats of paint. Wait about 2 hours before moving on to the next step. Apply the shellac to the utensils one side at a time. This process takes a while because each of the coats takes 6 hours to dry. We applied ours during a rainy week and it took even longer. Just be patient, or you will end up with smudges like we did. After the first coat of shellac dries, sand the shellac gently with a small grit sandpaper. Wipe clean with a damp cloth before applying the second coat. Allow the shellac to dry for 72 hours before cleaning and using the utensils. Wash the utensils by hand with soap and water before using, and after every use. Our shellac was not dishwasher safe. Check that yours is before placing your shiny, new utensils in the dishwasher. If you make this project, share your results with us on the Schooling a Monkey Facebook page!